Is this because the people on Twitter who I follow and who follow me do not represent the norm or is it that we are so passionate about testing we do not see this happening in the testing world? Are there many people who work in testing who see testing as a platform to development? I have experienced this and seen it happen and wonder whether my experience is unique. I have heard people say they are using testing to get into development and that they look at testing as being a means to an end. I have witnessed companies treating testers as failed developers (moving bad developers into testing roles). I just couldn’t figure out whether these were just my experiences, or whether this was a real trend in the global testing world. With the help of the Ministry of Testing, I put together a survey to ask the testing community about this subject, so we could get an idea about what career progression options are available for testers. The following analysis presents highlights of some of the responses from the survey. 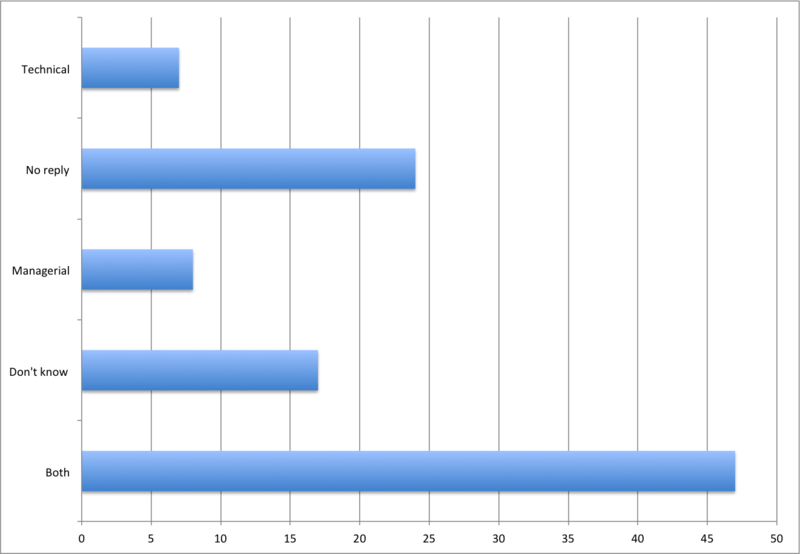 In total 103 people responded to the survey with an average age of 25-44 (72% in this age range. I am now starting to feel old!) The majority of people were from the USA, the UK and India accounting for nearly 60% of all respondents; the largest portion (29%) of which came from the UK. When asking about which was the closest city the largest amount came from London (9%) or Bangalore (5%). The testing industry still appears to be quite male-dominated, with over 75% of the survey respondents stating they were male. This matches my own experiences. I think it is something we need to challenge and figure out how to encourage more females to choose a career in testing. Maybe we need to start focusing more on the humanitarian and creative aspects that testing applies to, rather than the technical STEM focus that seems to be indicative of experiences in the early stages of a software testing career. The industries in which testers are currently working are varied and diverse but the majority appear to work in Finance, Retail or E-Commerce. 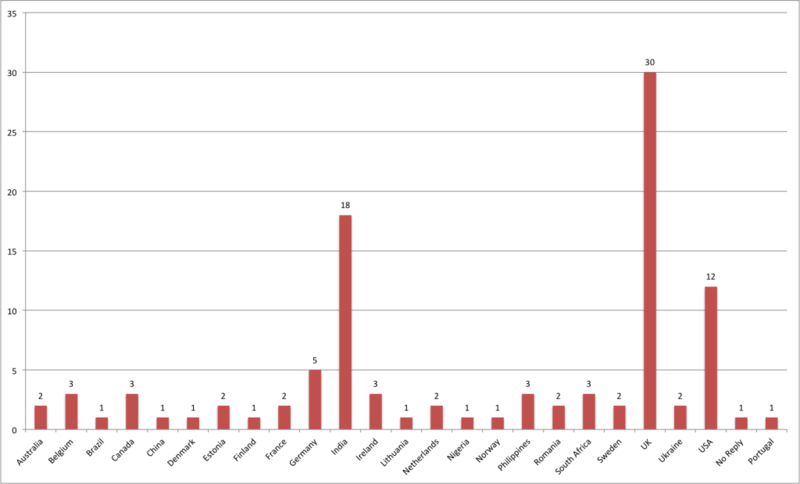 It was interesting to note from the survey results that many testers have come into the testing field from a development background (20%), most of them from the UK. There also seemed to be a large number of people that have entered directly into the testing field, and want to stay there. I expected to see a large amount that came newly into testing and saw it as a progression to development. The results from the survey did not seem to back this up. With 75% saying they wished to stay in testing. Of the ones that did want to change careers it was surprising to see that they did not want to go to development but wanted a total career change, such as farmer or entrepreneur. A few said they would like to be involved in teaching, training or mentoring within the field of testing. One of my original theories before doing this survey was that a lot of companies did not offer both managerial and technical paths for testers with most testers having to have to move to management to progress. It was interesting to see that nearly half of the companies appear to have both a managerial and technical path (46%) for testers, so technical testing appears to be a career path that is increasingly being endorsed within organisations. Does your organisation offer technical and management career paths? There is a need to have a clear progression for testers; it needs to be tester specific and not modeled on a developer career path model. It should be said that following a technical or managerial path are not the only options. 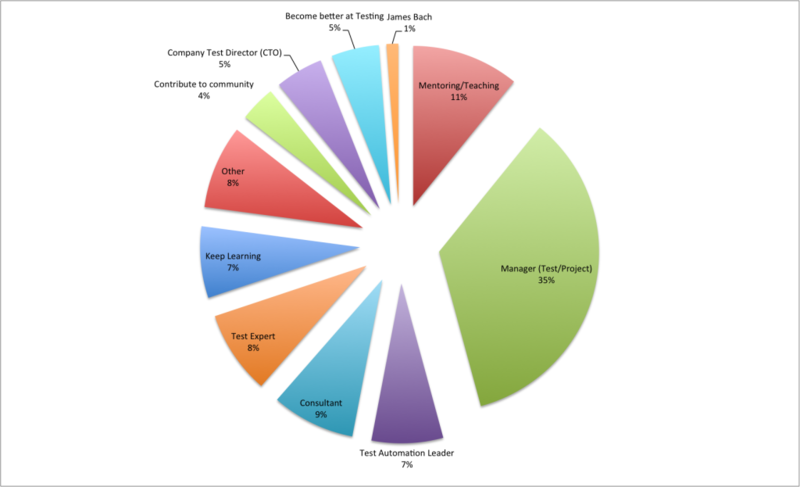 The survey results show that quite a few testers want to become coaches, mentors and tutors and I am not sure if this is supported within the industry yet as a viable career path. If it is not, then maybe you (the reader) need to influence this and be the one who makes this an alternative career path in the place you work. If your company does not have these options then maybe it is time you spoke up and become the person who takes the first steps in your company to change this. You may be able to do this by talking to your HR department and senior management on career options for the company and the benefits that this could offer them. Benefits such as being a selling point for retaining or recruiting people to come and work for your company. You may be able to use this article as a reference point. One point that came from the survey was that even if companies appeared to offer both technical and managerial paths, most people still aspire to become a manager (35%). The survey also showed that over 75% of people wanted to stay in testing as a career, which is very positive news for the future of testing (Testing is NOT dead!). It appears that a lot of testers feel that they are introverts (40%) compared to 26% who felt they were extroverts. I found this interesting, since I feel testers need to be a mixture of both: sometimes stepping back and at other times pushing forward. I expected more people to respond that they were equally extrovert and introvert since in my opinion this is what testers need to be. There have been a few discussions about testers and learning coding, Rob Lambert has this to say, while Michael Bolton presents his view here. I have talked about this on my blog previously here. Dorothy Graham once said that forcing testers to program means you may lose a good tester but gain a rubbish developer (or words to that effect). The results from this survey show that most people (46%) would like to learn automation or coding skills, which may be influenced by the current talk within the testing community or the fact that many companies are looking for multi-skilled testers. I personally am not sure if it is a good thing that testers see automation and coding as the main skills they want to have. What about skills in human interactions, User Experience (UX), security, social and economic studies? This also appears to be at odds with the question asked about what the main skills a tester actually needs are, with coding and automation coming in at 2% and thinking, communication, manual and exploratory testing coming in much higher – 20% for both. This is a similar finding as to that reported in a previous survey for The Testing Planet which shows that testers do not value learning to program as a key skill they should have, or that they want to learn in comparison with e.g. more effective communication skills. When researching the field of testing skills and the perception of testers I found many articles. One, in particular, was of great interest. Many companies still see testing as “low skilled work”. How can WE change this? We as testers need to take action to change this perception of testing being low skilled. It does not help if we don’t continue to question whether automation can do the job of the thinking tester (or whether testing is simply following scripts without thinking or questioning. We need to demonstrate that our work has value or more importantly that testers can protect the value of both the [business] customer and their product (8). We need to start to have a passion and a pride in our profession. I accept that there are many people who are in testing who want to do it as a 9-5 job. Such people may not see the harm that is being caused to our profession by not being aware or even worse knowing and ignoring, the challenges it faces. These are the people who, as Tony Bruce puts it are doing a job rather than creating a career. Each one of us has a responsibility to try and influence others within our profession to take a more professional approach. If you have no interest in testing then maybe you need to find something else to do that ignites your passion. By demonstrating enthusiasm and being professional we can start to change the perception that testing is a low skilled activity. If people are in testing because they have a passion for it, rather than because they see it as a path into a development role, then others within the software development world may start to see testing as a valuable profession. The results from the survey do not appear to back this up. 75% wanted to stay in testing – none wanted to move to be a developer (see Aspirations chart), so why did it concern me? There appears to be no evidence backing up the fact that developers get paid a lot more than testers based on some research I have carried out. The statement that there must be something wrong with you if you are still a tester for more four years is very worrying especially if this is a popular viewpoint in the software development world. I would hope it is not and if you come across this attitude then you as a professional can and should challenge it. So it still appears as though developers are still being paid more than testers (at this time) unless you are in the QA business. Maybe we should get into the QA business rather than get out as suggested by Michael Bolton in his article, Testers Get Out of the QA Business. What is interesting is the question – does a title make so much difference? From the research I have done, it appears so, and this is different from what Martijn De Vrieze concludes in his article on Job Title Paradox. Rightly or wrongly, your title can influence how much you get paid and this is something to be aware of when looking at testing roles. I believe the future of testing and the skills required are starting to be addressed and people are becoming more aware of what is required of them as a professional. We have people coming into the profession who are passionate and who want to build a testing career rather than a 9-5 job. Judging by the survey results, there are many views and opinions on what skills are required to be great at testing. The main skills that stand out are the ability to think, and use critical thinking. This surprised me; however, it may have been because the people completing the survey are those who are actively involved in the testing community and as such caused a bias in the results. How people outside of the testing profession see testing is still very subjective, but the survey results would suggest the perception of testing is improving with almost 40% of people who completed the survey saying that they feel respected, good or equal as a tester within a development environment. Hopefully, in the long-term testing will be seen in the same way as development as an important and crucial profession in its own right. Having been involved in testing for over 20 years and with more than 24 years of general IT experience, John Stevenson remains surprised by how exciting the testing field is and how many new things can still be learned. John is passionate about social science, psychology, photography and gardening, and in addition to being active within the testing community, he also blogs (www.steveo1967.blogspot.com) and tweets (@steveo1967) regularly.